Sai Baba devotees need not worry about good Shirdi accommodation. We carry Baba’s legacy Shradha & Saburi in real sense. These two important aspects of human life get personified at Hotel Shradha Saburi Palace, Shirdi. This Shirdi Hotel is the latest aspirant, in hospitality industry and possibly the most favored destinations amongst Shirdi hotels. Hotel Shradha Saburi Palace has scaled a new bench mark in hospitality sector ever since its establishment from the month of July 2012. Finding an ideal location amongst Shirdi hotels, has now become easy, thanks to the high quality standards maintained by us. Tourist looking for Shirdi accommodation with peace comfort & cozy ambience always give first choice to Hotel Shradha Saburi Palace. This Shirdi hotel is distinctly carved out with real significance to Shradha (dedication), keeping tourists comfort & care as sole mission. 24 room with classy finish assure you best of modern amenities at affordable tariff. This centrally located Shirdi accommodation facilitates you to have quick access to Sai Baba temple. 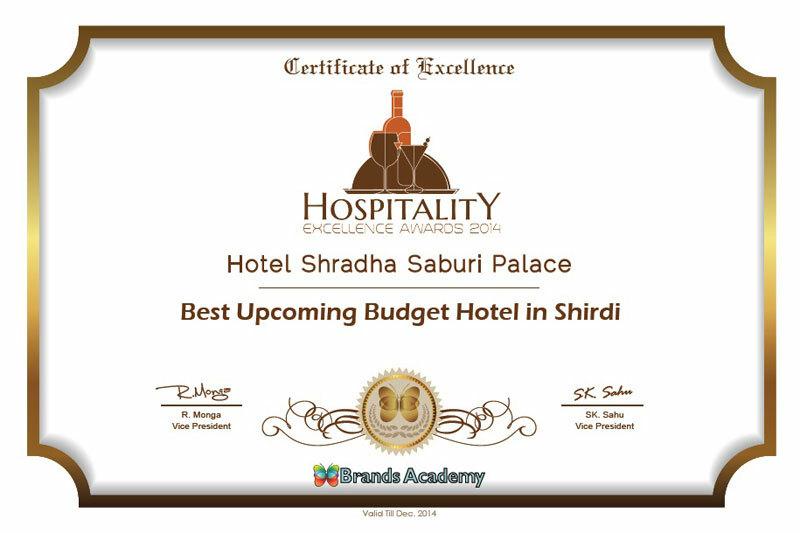 Shirdi accommodation booking at Shradha Saburi Palace has now become a natural choice for thousands of Shirdi visitors.